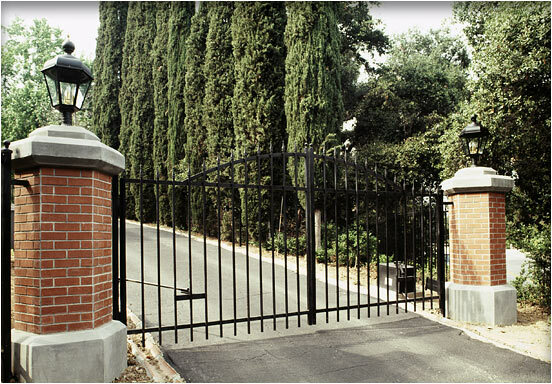 Larger Project 3-9, Gates and Pillars » Roger Perron Inc. Here are the gates and pillars accessing the property. We used red brick and a precast concrete base and cap within a hexagonal shape. The gates are a simple steel design with openers. The inside of the driveway has sensors that detect a car leaving the property so that the gates open automatically. See all the designs ideas we had for the gates in the next 3 images. This photo was taken immediately after construction.